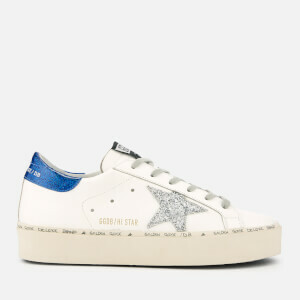 Black suede low top trainers with distressed details from Golden Goose Deluxe Brand. The men’s black suede sneakers are designed with signature star appliqué, contrasting orange leather on the heel and metallic branding on the vamp. The low top trainers sit on a textured white sole with distressed details for a worn-in feel. Logo detail on the tongue and heel complete the design.